The Dodge Charger SRT Hellcat may be the quickest and fastest saloon mass production car, but I’ll stick with my rental FIAT 500… not that I really have a choice anyway. 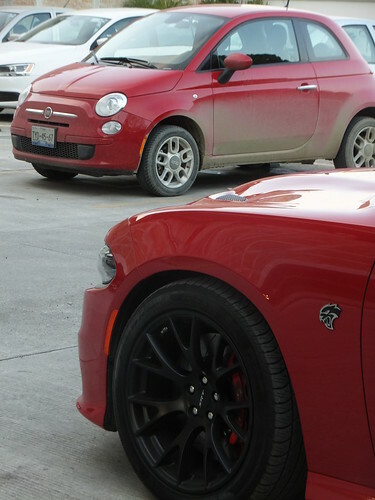 Both vehicles are produced by the FIAT Chrysler group. "Fiat Chrysler Automobiles (FCA), the seventh-largest automaker in the world, designs, engineers, manufactures and sells passenger cars, light commercial vehicles, components and production systems worldwide. The Group’s automotive brands are: Abarth, Alfa Romeo, Chrysler, Dodge, Fiat, Fiat Professional, Jeep, Lancia, Ram, SRT and Maserati, in addition to Mopar, the parts and service brand. The Group’s businesses also include Comau (production systems), Magneti Marelli (components) and Teksid (iron and castings). Formed in 2014 through the merger of Fiat (founded in 1899) and Chrysler (founded in 1925), FCA is listed on the New York Stock Exchange (“FCAU”) and the Mercato Telematico Azionario in Milan (“FCA”)."